Did you hear the news? 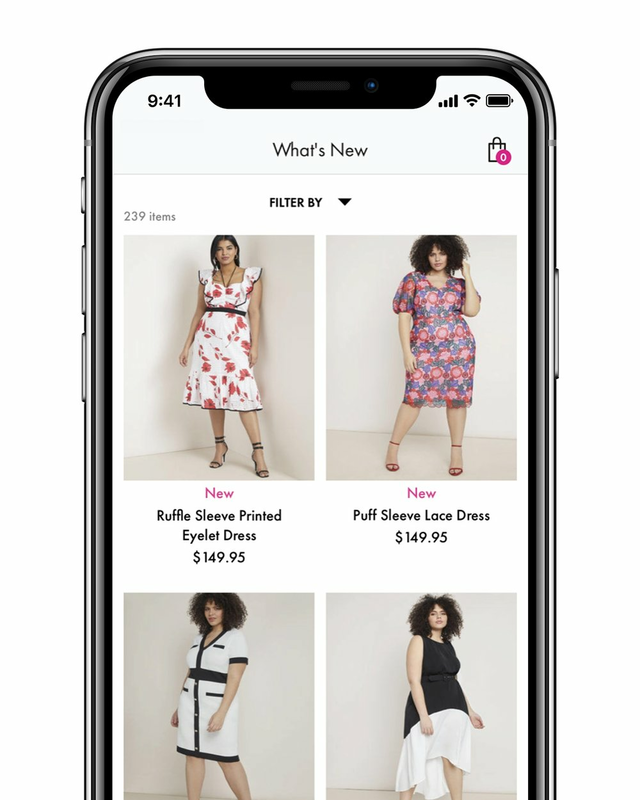 We’ve launched our ELOQUII app! And the best part? It’s the most rewarding app ever. Yes, that’s right — download our iPhone app to enroll in our first ever ELOQUII rewards program. You asked, we listened! We’re excited to have you download our app and engage with our ELQ Rewards program, and have written out all what you need to know about it. Check it out! What does our iPhone app do? Well it’s another shopping channel that’s simplified, always with you on the go, and optimized for easy mobile checkout. Plus, when you download you’ll have access to some amazing things like: our ELQ Rewards program where you get 10% back every time you shop; early access to one new arrivals collection per month; instant notification about back-in-stock items. Amazing, right? We’re thrilled to be able to offer these perks to our app and rewards program (make sure your push notifications are on!) and can’t wait for you to start shopping! Download the app from the U.S. Apple App store. Log-in or create an account. You will automatically be enrolled in ELQ Rewards once you do so. You may notice that our app looks very similar to our website — you’re not wrong! Scroll through our home page, check out our newest arrivals, shop collections (like our Priscilla Ono x ELOQUII), and see what’s going fast. You can also click over to our Categories page to browse a specific type of clothing our site. Our What’s New tab brings you right away to our newest arrivals so you can shop the latest styles all the time. See something you love? Maybe you’re eyeing our new One Shoulder Fit and Flare Dress from our Bold Rush collection (don’t worry, we are too) — simply click the heart icon in the top right corner on the product page to automatically add to your Love It list to save for later checkout. Under Account you’ll find all your personal details and shipping information with the new(!) sections of ELQ Rewards and Track Your Order. Under Rewards you can check-in on your Reward amount to redeem for future purchases. And now you can also track your order once it leaves our warehouse to when it arrives to your door. We’re so excited to share our new iPhone app and can’t wait for you to download and start shopping! Have questions about ELQ Rewards & our app? Check out our list of FAQs below and read all terms and conditions on our site if you still have questions! What phone platform is this app compatible with? The ELOQUII App is only available on the iOS iPhone platform. We hope to be in the Android store in the future! What is the ELQ Rewards program? ELQ Rewards is our rewards program where users can earn ELQ Reward Dollars on their ELOQUII purchases. To join, download our app and create an account or log in and you’ll be automatically enrolled! Remember to stay logged in when you are making an eligible purchase through the Eloquii app or site to earn and redeem your ELQ Reward Dollars, as rewards cannot be earned or redeemed using guest checkout. How do I join the ELQ Rewards program? You can join the ELQ Rewards program exclusively through the ELOQUII app. Once you have the app, if you already have an ELOQUII account, just log in and click the “Start Earning” button on the next page. If you don’t have an account yet, you can create one inside the app. How do I earn ELQ Reward Dollars? Easy! Log into your account to shop in the app or on the site and earn ELQ Reward Dollars on every eligible purchase. Rewards will be applied to your account on the next business day after your order ships. To earn rewards in stores, access your ELQ Rewards barcode via the app and present it at checkout, and we’ll apply your ELQ Reward Dollars within a business day. How do I redeem ELQ Reward Dollars? Redeeming is easy! When shopping in the app or online, we’ll display your available ELQ Reward Dollars in your cart. Check the box next to the ELQ Reward Dollars to apply them to your order. When shopping in store, let the associate know you have a reward to apply and present your ELQ Rewards barcode via the app. Do my ELQ Reward Dollars expire? Rewards expire if your rewards account has been inactive (no earning or redeeming) for 12 months. We’ll email you if this is about to happen! Do I earn ELQ Reward Dollars on shipping fees and tax? No. ELQ Reward Dollars are earned on your merchandise total, after any discounts have been applied and before shipping and tax. Can I earn and redeem ELQ Reward Dollars in store? Yes! Just make sure you have our app downloaded and the store associate will scan your ELQ Rewards barcode via the app prior to completing checkout to earn or redeem rewards. When will I get my ELQ Reward Dollars and where can I see my ELQ Rewards balance? For orders placed in the app and on the site, ELQ Reward Dollars are placed on your account one business day after your order has shipped and payment is processed, and the amount earned will be based on the item(s) that ship, less any cancellations. If you purchased in-store, rewards earned will be placed on your account within a business day. You can find your account balance here: www.eloquii.com/MyELQRewards, or by navigating in the app to Account > ELQ Rewards. Can I earn ELQ Reward Dollars for past purchases? No. ELQ Reward Dollars can only be earned on purchases made after enrollment in the program, either via a logged in account or in a store when the ELQ Rewards barcode is presented. What happens to my ELQ Reward Dollars if I make a return? The rewards you earned for the item(s) being returned will be deducted from your rewards balance. Any ELQ Reward Dollars that were redeemed on item(s) being returned will be re-added to your ELQ Rewards balance within a few business days of the refund posting. What happens if my current rewards balance is less than the rewards deducted for a return? If there are not enough rewards available in your account, it will result in a negative reward balance. Subsequent purchases will work your status back to a positive balance. Negative rewards do not expire. Can I earn ELQ Reward Dollars if I check out as a guest? No. You must be logged in to earn or redeem ELQ Reward Dollars. Can I transfer my ELQ Reward Dollars to another user or account? No. Rewards are non-transferable and only valid for the account that earned them. Can I combine my ELQ Reward Dollars from different purchases to use on one new purchase? Yes. ELQ Reward Dollars are automatically combined for you as you make purchases in the program. When you choose to redeem them, your entire rewards balance will be used, up to the merchandise subtotal of the purchase you’re using them on. Can I save up my ELQ Reward Dollars to redeem more at once? Yes. Earned ELQ Reward Dollars will remain in your account until they are used, as long there is account activity (earning or redeeming) at least once every twelve months. Rewards expire if your rewards account has been inactive (no earning or redeeming) for 12 months. We’ll email you if this is about to happen! How do I cancel my ELQ Rewards account? Please contact us to request that your ELQ Rewards account is closed. If you close your account, then any remaining ELQ Rewards Dollars in your account will be forfeited.